Mens vi i St Hallvard kirke var 25 personer i messen på dagens store fest, siden festen nå (siden 2008 i vårt bispedømme) feires på dagen og ikke på nærmeste søndag (det er både fordeler og ulemper med dette), var det helt fullt i Peterskirken. Se videoen under. I couldn’t get to Fr Hunwicke’s Ordination last night, at the Oxford Oratory, I heard it was very beautiful, there a few pictures here. I also heard the celebrant preached against the wickedness of “rubricism”; a little unfortunate as following them with a degree of precision is the great charism of our English Oratories. I know it was Vigil in most places but in Westminster it was the Feast of St John Southwell and of course for us a celebration of a first Mass. … One of the important things I have always said about the Ordinariate which I think cradle Catholics just don’t get is its humour which Fr Hunwicke supplied in heaps. … It was a really beautiful celebration for the eve of St Peter and Paul; Fr Hunwicke in communion with the Church and now a happily a priest of the Catholic Church. … I would like to dwell more on this point, for it seems to be an attempted solution to a pastoral problem, namely that the people in the congregation (at least in the priest’s estimation) see themselves as merely watching the priest, as separated from him, perhaps even as isolated from him by the intervention of the altar itself. The attempted solution in the scenario I have described lies in re-locating and re-orienting the selected members of the congregation so that they are on the same side of the altar as the priest and facing in the same direction as him. 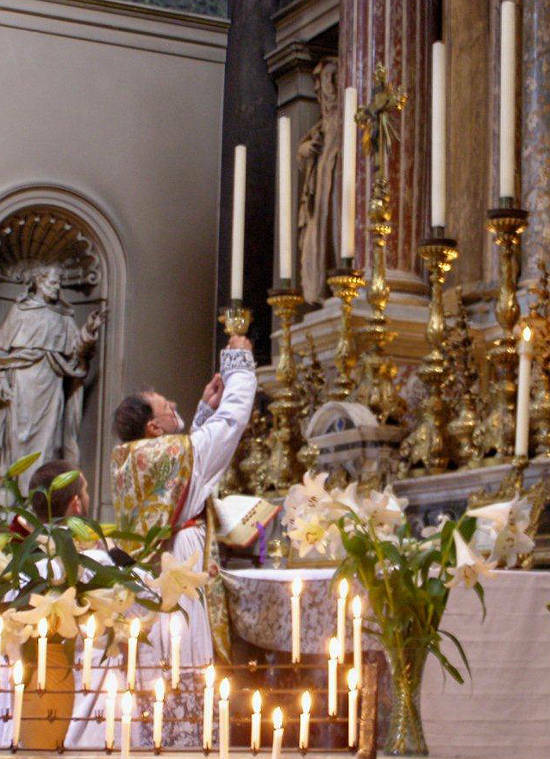 In a Mass celebrated ad orientem, the problem disappears, since the entire congregation is situated “behind the altar.” They all stand together with the priest. They are all associated with him as he offers the Eucharistic Sacrifice in the person of Christ. The interior and spiritual orientation of the Mass is reflected in and bolstered by the physical posture of the priest and people. As Catholics we are constantly called to live out our faith in our daily lives. In our charities, we comfort the sick, feed the hungry, care for the poor, and protect life. In the marketplace, our values guide us. We strive everywhere to practice what we preach. Across America, our right to live out our faith is being threatened – from Washington forcing Catholic institutions to provide services that contradict our beliefs, to state governments prohibiting our charities from serving the most vulnerable. And around the world, it’s even worse – Catholics face persecution and even death for their witness. How interesting that the point of conflict between Henry and Sts John and Thomas was “marriage”. In reality both John and Thomas understood that the King wanted to usurp the place of God, practically speaking the issue was that Henry wanted to take control of men’s consciences. 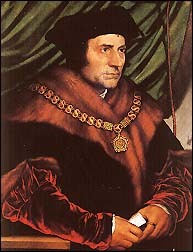 In the case of Thomas especially his crime was a “thought crime”, daring to think differently from the King and the government. St Thomas had deliberately kept silent on the matter whilst St John had quite simply said that what the King intended to call “marriage” to Ann Boleyn was in reality “adultery”. Henry used the Law and the death penalty to force men to think his adultery was “marriage”, he made “obedience to conscience” mean “treachery”. By the Law sin was made virtue and virtue vice. We see again, in our own age, governments wanting to take control of consciences, governments taking control of language, changing fundamental words. As in the days of Moore and Fisher the issue is still about the definition of “marriage”. There will be no way to define any longer what we had previously understood by that word “marriage”, the redefinition will colour and redefine our whole culture, our appreciation of history, our understanding of human relationships, our education. Both the UK and the US the government is using all its muscle not just to change society but how we think and understand ourselves. We stand on the brink of something truly frightening, truly sinister. Having started where will it end? … Når Kristus er nær i evkaristien, er det heile hans frelsesverk som er nærverande, realpresent. Vi feirar Kristi offer, det offeret som sonar alle synder og er sjølve grunnlaget for den nye pakta. Offeret som oppfyller alle ofra i den gamle pakta, som då Moses oppretta pakt mellom Gud og Israel; han «tok paktsboken og leste den opp for folket, og de sa: ‘Vi vil være lydige og gjøre alt det Herren har sagt’. Da tok Moses blodet, stenket det på folket og sa: ‘Dette er blodet som hører til den pakten Herren slutter med dere på grunnlag av alle disse ord». Det er dette vi høyrer ekkoet av når Jesus seier: Dette er mitt blod, paktsblodet… Eller som vi også høyrde: Ikke med blod av bukker og okser.., men med sitt eget blod har han kjøpt oss fri for alltid (Hebr 9). Jeg har nå nettopp tatt bort lenken til p Arnfinns blog fra min egen blogg, men muligens blir hans siste innlegg (med mange hilsener) liggende på nettet en stund til. The basis for this year’s reflection is a paper entitled The ‘Basic Structure’ (Grundgestalt) of the Eucharistic Celebration According to Joseph Ratzinger, delivered at last year’s Conference by Professor Dr. Manfred Hauke of Lugano who drew attention to the debate between Franz Seraph Renz (1884–1916) and his student Franz Sales Wieland (1877–1957) of Augsburg who insisted that the Eucharist was essentially and meal, and the counter challenge of the Innsbruck dogmatic theologian, Emil Dorsch SJ (1867–1934), who asserted the essentially sacrificial nature of the Eucharist. This debate forms the theological background to the discussion, in its stricter sense, on the topic of the Eucharist as sacrifice or meal, which began in 1939 with some reflections by Romano Guardini, and culminated in the 1980s with the contributions of Joseph Ratzinger and Walter Kasper. Professor Dr. Hauke vil også i år holde et foredran om “the question of the systematical discussion on the “essence” of Eucharistic Sacrifice”. First Mass in the Extraordinary Form; London at the Brompton Oratory. Low Mass, Thursday June 28, 11.30; by kind permission of the Provost. First Mass in the Ordinary Form; Oxford in the Church of the Holy Rood. Solemn Vigil Mass of Sunday, Saturday June 30, 6.00, by kind permission of Fr Paul King and Mgr Andrew Burnham. I plan also to preach. Han er interessert i at mange kommer både til hans ordinasjon og til disse to messene. Jeg kunne gjerne tenkt meg å være der, med det er dessverre umulig. From the Sermons of St Augustin, Bishop of Hippo. 20th on the Saints. Bloggen Rorate cæli påpeker at det man i dag vanligvis kaller den tradisjonelle latinske messen ble promulgert for akkurat 50 år siden i dag, 23. juni 1962. Pave Johannes XXIII hadde da, sammen med sine medarbeidere, gjort noen små forandringer i messen, slik pave Pius XII også hadde gjort på 50-tallet. Jeg feirer selv denne messen kommende søndag kl 19.00. Here the Church requires that the sanctuary be marked off, calling for, yes, even now, a particular structure; in other words, an altar rail. The altar rail serves beautiful symbolic and considerately practical purposes within the Mass. Further, it makes basic psychological sense as well. Let me explain. Firstly, we call it an altar rail; the name has reference to the altar. This rail can be seen as an extension of the altar. Christ becomes present on the altar and invites us to be fed at His altar via the rail. Very often the appearance of the rail matches the appearance or imitates the appearance of the altar. In churches where there is no rail, this symbolism is very diminished or completely destroyed. There is a beautiful parallel in the series of events that lead to the distribution of Holy Communion. Just as the priest goes to the altar, offers the sacrifice, and brings that Sacrament to the altar rail for the faithful, so every Christian is called to Sunday Mass, called to the altar, and, nourished by that Sacrament, is sent out to bring Christ and His gospel to the world through daily life. Practically, the rail is a help to people, both physically and spiritually. The use of rail and the way Holy Communion is distributed with it sets a solemn pace for the reception of Holy Communion. On the part of the priest, more of his time is spent actually distributing the Blessed Sacrament and less time waiting. On the part of the person receiving, the hurried tone is removed; there is a great opportunity for quiet and prayer both a few moments before and after receiving our Lord. The rail also is a help to people in kneeling and standing back up. …. Vatikankonsilet sa ingen ting om kommunionsbenken (eller er det lov å kalle den alterringen også på norsk, selv om dette høres luthersk ut? ), og det gjorde heller ikke liturgirevisjonen i 1969, men likevel forsvant disse fra alle katolske kirker på slutten av 60-tallet. Nå er det heldigvis (håper jeg) blitt tillatt å snakke om dette igjen; vil det ikke være fint å knele (igjen) når man skal motta kommunion? Slik lyder inngangsverset på den store høytidsdagen: De ventre matris meæ vocavit me Dominus nomine meo: et posuit os meum ut gladium acutum sub tegumento manus suæ protexit me, et posuit me quasi sagittam electam. – Alt i min mors liv kalte Herren meg ved navn og han gjorde min munn til et skarpt sverd; i skyggen av sin hånd har han gjemt meg og gjort meg til en utvalgt pil. Det feires en tradisjonell latinsk messe denne søndagen – i St Joseph kirke i Akersveien i Oslo kl 19.00. Tekstene for messe kan leses her. Datoer for TLM til høsten er også på plass – se her. Jeg legger ut denne videoen uten kommentarer i første omgang, siden jeg fortsatt er på ferie. Etter fire nokså intense museums-dager i Philadelphia and New York City, har vi nå en roligere dag – søndag. Jeg feirer to messer her i St Patrick’s i Glen Cove, Long Island, siden sognepresten, dom Daniel, er alene for øyeblikket og det er fem messer her hver søndag. Dom Elias – som vi kjenner best av de to korherrene som bor her – er sogneprest i en nabomenighet, og feiret messer der i dag. I morgen, mandag, skal vi reise nord-vest innover staten New York, til Binghamton, for å besøke min kones niese, med mann og seks barn. Deretter er det to intense museumsdager i Boston, før vi reiser hjem. Når dette leses (tirsdag 11.05) reiser vi fra Gardermoen til Newark, New Jersey. Jeg tror det er første gang jeg reiser direkte til USA, oftest har det vært via København eller Amsterdam. Vi blir borte i 12 dager, og jeg kommer dessverre til å gå glipp av p Arnfinns begravelse. Vi skal besøke museer i Philadelphia, New York og Boston, og besøke venner på Long Island (korherrer vi kjenner fra Bergen/Wien) og familie i Binghamton (i upstate New York). Søndag kveld kl 20.30 hørte jeg den fryktelige nyheten at p Arnfinn Haram var død. Senere på kvelden fikk vi prester en e-post fra biskopen med nyheten, og nyheten ble også lagt ut på katolsk.no sammen kveld. Biskopen ba oss alle lese den hellige messe for p Arnfinn, og det gjorde jeg nå mandag kveld. Mandag morgen hadde mange aviser fått med seg nyheten, og det ble også sagt på NRKs morgennyheter. Vårt Land var kanskje først ute med en grundig artikkel, litt mer senere på dagen, og HER og HER på verdidebatt.no. Dagen skriver om ham flere stder, HER , minneord ved Johannes Kleppa, en samling hilsener, og Bergens Tidende skrev også om ham. Søndag ettermiddag ved 16-tiden rykket ambulanse og politi ut til et område sørøst for Damtjern på Krokskogen. Et Sea king redningshelikopter ble også satt inn. Syklisten befant seg sørøst for Damtjern da han fikk et illebefinnende. Mannen ringte selv nødnummeret men samtalen ble brutt. Politiet fryktet da at noe alvorlig var tilstøtt mannen. Forbipasserende forsøkte seg på livredning, men livet sto altså ikke til å redde. Mannen som er i 60-årene og er fra Oslo, ble erklært død cirka klokken 18.00. Det er ingen mistanke om noe kriminelt. Selv traff jeg Arnfinn første gang vinteren 1978/79, på en samling for FBB-stud (For Bibel og Bekjennelse), selv om jeg nok hadde sett ham på MF fra jeg begynte der høsten 1975. De årene jeg bodde i Bergen møtte jeg ham ganske ofte, bl.a. på de årlige samlingene fir Kirkelig Fornyelse – før han ble katolikk. Jeg husker spesielt en lang samtale jeg hadde med ham høsten 1997; jeg var på Allen Hall presteseminar det året og det ble kjent at Arnfinn ville bli katolikk, og vi snakket grundig om hvordan livet som katolikk og katolsk prest ville kunne bli. Så var det underlig å se ham noen måneder i sivile klær, før han fikk på seg dominikanernes habitt; som luthersk prest gikk han nemlig absolutt alltid i sutan. Jeg har også mange andre minner fra møter med Arnfinn de siste 10 årene; trist at han skulle gå bort så tidlig. Også jeg lyser fred over hans minne. 1. «Troens dør» (Apg 14,27) er alltid åpen for oss. Den fører oss inn i livet i felleskap med Gud og gir adgang til hans Kirke. Det er mulig å gå over denne terskelen når Guds ord forkynnes og hjertet lar seg bli formet av forvandlende nåde. Å gå inn gjennom den døren er å legge ut på en reise som varer et helt liv. Den begynner ved dåpen (se Rom 6,4) hvorigjennom vi kan henvende oss til Faderen, og den ender med ferden gjennom døden til evig liv, frukten av Herren Jesu oppstandelse, hvis vilje det var, ved Den Hellige Ånds gave, å dra dem som tror på ham, inn hans egen herlighet (se Joh 17,22). Å bekjenne troen på Treenigheten – Fader, Sønn og Hellig Ånd – er å tro på én Gud som er kjærlighet (se Joh 4,8): Faderen, som i tidenes fylde sendte sin Sønn for vår frelses skyld; Jesus Kristus, som i sin død og oppstandelses mysterium forløste verden; Den Hellige Ånd, som leder Kirken gjennom århundrene imens vi venter på Herrens gjenkomst i herlighet. 1. “It is for their sakes that I sanctify myself, so that they, too, may be sanctified by the truth” (Jn 17:19). Is the Holy Sacrifice of the Mass the centre of my spiritual life? Do I prepare well to celebrate Mass? Do I devoutly celebrate the Mass? Do I make an act of thanksgiving after Mass? Is the Mass the centre of my day in giving thanks and praise to God for his blessings? Do I have recourse to his goodness? Do I make reparation for my sins and for those of all mankind? 3. “Zeal for your house consumes me” (Jn2:17). Do I celebrate the Holy Sacrifice of the Mass according to the rites and rubrics established by the Church? Do I celebrate Holy Mass with a right intention and according to the approved liturgical books? Am I attentive to the sacred species conserved in the tabernacle and careful to renew it periodically? Do I pay due attention to the sacred vessels and ensure their conservation? Do I wear in a dignified fashion all of the sacred vestments prescribed by the Church? Am I conscious that I actin persona Christi Capitis? 2. Pinsedag 2012 er ”Summorum Pontificum- dagen” i St Ansgar menighet. Etter over 40 år feirer menighetens sogneprest den gamle liturgien, med kor og organist og med ministranter med lys, kors og røkelse! Den gamle messen har riktignok vært feiret flere ganger i St. Ansgar kirke de siste årene, men av gjestende prester og uten stor høytidlighet. Fra nå av vil Den ekstraordinære form være en del av det liturgiske livet i St. Ansgar menighet og vil etter hvert finne sin faste plass i vår ”timeplan”. Det er mitt håp at mange i menigheten vil bli glad i den ekstraordinære form. Den er verdifull i seg selv av mange grunner; Den har en lang og ubrutt tradisjon og enda eldre røtter. Den har stor en stor skjønnhet og har skapt stor kirkemusikk. Men noe annet er like viktig; Den ekstraordinære form er også verdifull fordi den kan inspirere oss til å feire den ordinære form mer trofast mot kirkens tradisjon. Dette tror jeg også er en tanke som Pave Benedikt har. Hvis alle katolikker blir fortrolig med den tradisjonelle liturgien, da får vi hjelp til å forstå liturgiens utvikling og dermed også til bedre å forstå hva liturgi er. Da forstår vi enda bedre hvorfor vi gjør det vi gjør uansett form. Selv om det er klare forskjeller mellom de to messebøkene er det likevel mer som er likt og jo likere de to formene feires jo tydeligere vil vi se at Kirken har bare en liturgi, selv den har flere riter og vårt rite, det romerske, har to former. Les mer om dette på St Ansgar menighets blogg. Tittelen på dette innlegget kan muligens forbause mange, spesielt siden vi i disse dager feirer Corpus Christi, som nettopp fokuserer på tilbedelsen av sakramentet. men alle ting kan overdrives, og enda mer presist; man kan legge så mye vekt på en sannhet, at en annen sannhet lider under dette. Through the priestly character the priest receives the power to renew in persona Christi the sacrifice of obedience and charity accomplished on the cross; he offers it in an unbloody way on the altar at each Mass he celebrates. 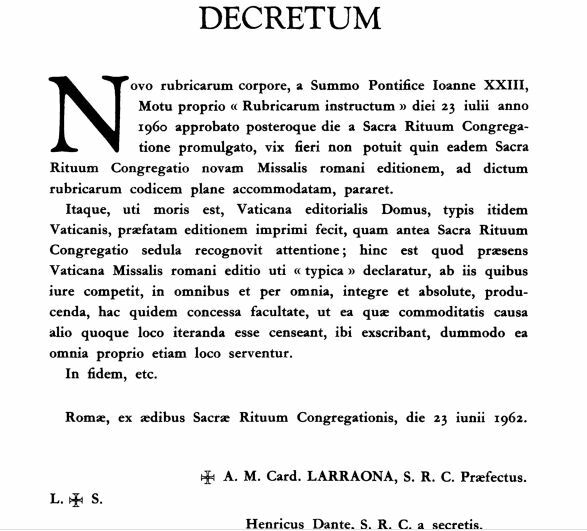 This doctrine belongs to Tradition and is found in St. Thomas, the Council of Trent, and Pius XII. The priest essentially is made for the Holy Sacrifice of the Mass, for the sacrifice, for sacrum facere, “to do sacred things”; he is defined by the Mass. And that is very serious because it changes the perspective on the Holy Eucharist itself, which becomes only food or a spiritual restorative; this new perspective does not focus as much upon immolation and our Lord Jesus Christ the Victim who offers Himself as a sacrifice of propitiation for our sins. This is why it was so easy to go over to the idea of a meal-mass similar to the Protestants … who hate this veritable, propitiatory sacrifice. Now, this sacrifice is the essential work of the Church; when the Church gives out Communion, she unites the faithful to the Victim who continues to offer Himself to God the Father. We therefore have a participation in this state of victimhood …. If we do not insist on this aspect, we will end up no longer having a truly Catholic spirit …. The spirit of Christianity consists in making us into victims united to our Lord Jesus Christ: suffering and offering are the most beautiful, profound, and real treasures in the Catholic religion. One must then be careful not to separate the sacrament from the sacrifice, just as one must not separate the sacrifice of the Mass from the sacrifice of Calvary. St. Thomas sums up these two indissoluble unions in one sentence: “In the celebration of this sacrament of the Eucharist Christ is immolated” (III, q. 83, a. 1). Tankevvkkende, syns jeg. Etter at tilbedelse av sakramantet ikke var særlig “in” i Kirken på 70-80-90-tallet, er dette nå blitt mye mer akseptert, i alle fall her i Norge. I St Hallvard kirke har vi f.eks. tilbedelse fem dager hver uke, og vi har nettopp kjøpt en ny, flott baldakin, som vi skal bruke til Corpus Christi-prosesjonen på søndag. Men etter min mening vil det ta en hel del mer tid før vi mer tydelig forstår hva det innebærer at messen er et offer som presten bærer frem for Gud.